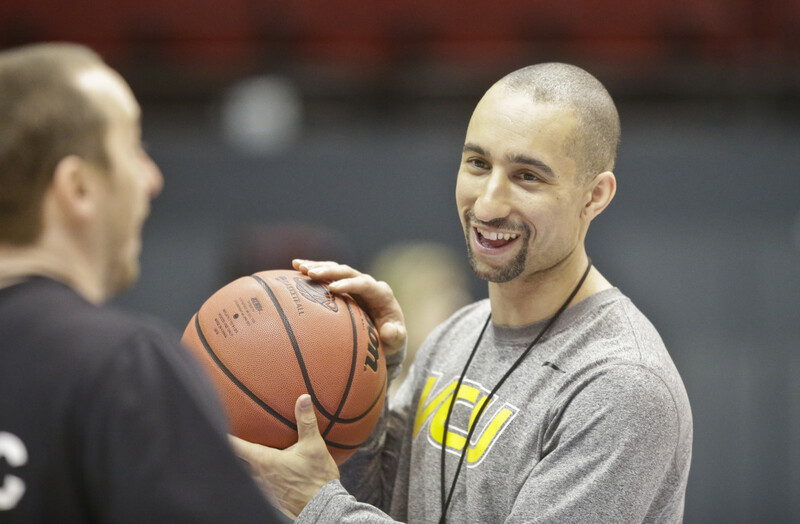 This month, we talked to Shaka Smart, VCU men’s basketball head coach. At 33, Shaka is among the youngest head coaches at the Division 1 level, a factor, perhaps, that contributes to his success with the young men in black and gold. Shaka helped the Rams net 27 wins last year in his first season at the helm. Before accepting the coveted post with VCU, he honed his skills as an assistant coach at Clemson and the University of Florida, each a perennial NCAA tournament team – just what the Rams coach hopes to be next month. Shaka and wife, Maya, a Richmond-based writer and editor, have been married for nearly five years and plan to expand their family one day. Can I choose a basketball court? If not, I’ll take the beach. I grew up in Wisconsin so I got my fair share of mountains in my younger years. I actually spread the love between my Blackberry and my iPad. Calls and texts on the Blackberry. Everything – and I mean everything else – on the iPad. Have several books that rotate on my nightstand because I like to do a lot of reading. However, the one book that always stays is The Power of Now by Eckhart Tolle. He’s my favorite writer, so anything he writes, I’m going to read many times. If you were stranded on a desert island, what’s the one CD you would want with you? Anything Michael Jackson. He’s the greatest of all time and changed music forever. That’s an easy one, Mama J’s. They always take care of us and have fantastic service and even better food. It’s like being back at Mom’s house. My wife is a freelance writer who travels a lot so it depends on whether she is in town. If she is, I like to order in and just hang out with her, maybe read a couple of books. If she is out of town, I’m in the office, trying to figure out ways we can take our program to even greater heights. It’s more of a we, but they love it when we win. My family is totally behind me and this program, so it’s always a great thing when we win and thankfully, we’ve been able to do that a lot in a short time here. I’ll say Clearwater, Florida. It has everything you need, especially the outstanding beaches. My wife and I frequented it when I was at Florida. Each day presents you with great opportunities to accomplish great things. That’s what drives me and motivates me to continue to improve in every aspect of life. A Rams basketball game, of course! (But only when we win). That’s actually my answer. My wife is always sitting right behind me on the bench with her little black and gold pom-pom and we have various family members that visit throughout the year. VCU Basketball is my life, and for us to be able to share that time is something that is very special to me. That I’m actually a huge soccer fan. It’s the most popular sport in the world and you can count me in on being a groupie. Watch out for Dave Giffard here at VCU who just finished his first season. He’s going to do big things.